Brenden was fantastic! We called him on helping us program the TVs, as well as a minor problem with the water heater. All items were fixed within 2 hours or less. Amazing!!! Our family had a GREAT time at Mia Vista Mare and plan to vacation there again soon. The home we rented for the week was wonderful, beautiful and relaxed. It provided several extras: bicycles, pool, and beach chairs and umbrellas. The entire family was able to have their own space as well as share time family time in the living areas. Abbey was awesome! She went out of her way to be super helpful and friendly to us! Shes the best! We loved 127 Dogwood. It was also a great location!!! Super close to seaside and east access to the beach! We will be back!! We recently stayed at Fin and Tonic. Fabulous house. Beautifully decorated and just a short walk from the beach. Our kids loved the arcade! Beds were extremely comfortable. Thank you for a wonderful week in paradise! Wonderful location and view. So convenient to the beach. Loved that we could spend the mornings at the beach and come up for lunch before heading back to the beach to finish the day. Loved Crabby Steves too!! Highly recommend this rental! We had an amazing vacation stay. The house is beautiful and comfortable. We had an extremely positive experience working with 30A Escapes and Joshua in particular. We were unable to fly out on our departure day due the Hurricane on the East Coast and Joshua was so understanding and flexible. We were so thankful. We will definitely be repeat customers and cannot wait to come back to this exact same carriage house. Will answered every question I had and was quite easy to reach. High Pointe is a lovely property on a gorgeous stretch of beach. 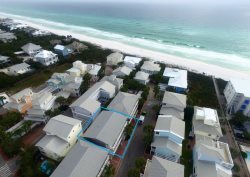 It has everything you need to really relax including the most amazing pool on 30a. Even Crabby Steves beach bar and restaurant is a nice feature for a cold drink or burger and there really is a crabby Steve hanging around and he is quite crabby! The team was prompt and actually came to the house to help quickly fix a couple of issues! Wonderful place for a big family who loves the beach to stay! Abby Sports was friendly, responsive and very flexible and accommodating. Had a great time! Wonderful sunsets, comfortable and well laid out condo.